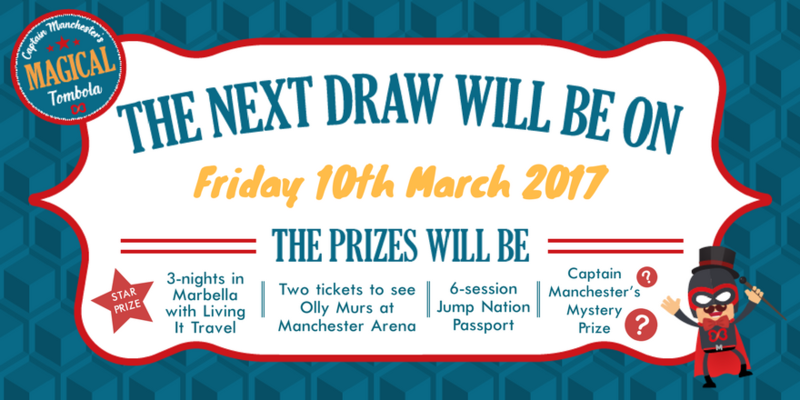 We’re delighted to announce the next draw of Captain Manchester’s Magical Tombola, to take place on Friday 10th March! Return flights for two to Malaga from Manchester. Three nights at a 4* hotel. Airport transfers not included. Two tickets, worth £81.60 each, to see Olly Murs perform at Manchester Arena on Friday 17th March. A package of six sessions at Jump Nation’s trampoline park in Trafford Park.